For the first time since its founding, the World Summit of Nobel Laureates gathered in Latin America—in Bogotá, Colombia. A city healing from decades of armed conflict and social upheaval, Bogotá served as a hub for thousands of international summit participants and nearly 15 Nobel Peace Laureates. The colors and sounds of the city rang loud and proud for the first week of February when world leaders and peacebuilders gathered to exchange ideas and dialogue. And against the backdrop of flourishing change and plans for peace, the summit’s youth program, Leading by Example, hosted over 500 passionate young adults from around the world. It was this program initiated by the Permanent Secretariat that welcomed the Ivy Council delegation of nearly 20 students to attend the summit. But for one Ivy Council delegate (and Ivy Inspire editor), Manuel Stefano Castaño, attending the summit transcended the entire framework of the youth program. Returning to the country called “home,” Castaño set foot on Colombian soil for the first time in nearly 20 years. 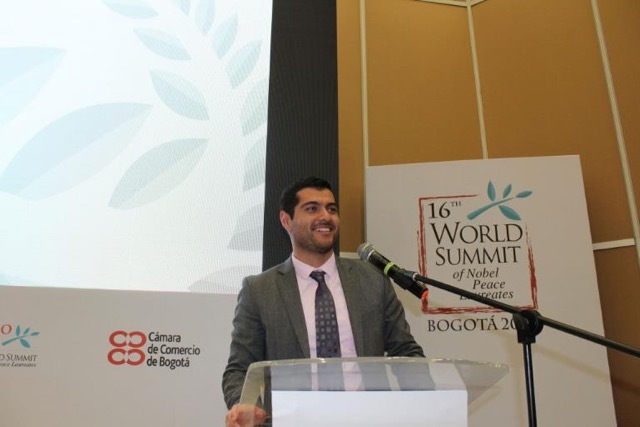 After fleeing the country because of ongoing civil conflict with FARC, his recent return afforded him an experience that no other Ivy Council delegate could have even imagined—national pride and emotional reminiscence to last an entire lifetime.